If you’re a writer, a potter or painter; a senior on the verge of packing it in; an editor, an agent; a "self-absorbed" artist or entrepreneur (who bristles at being called out "self-absorbed" yet knows we are); a young person who wants to understand your elders, especially if you and your grown siblings are cringing with what is she doing now ... or if you’re a reader who just plain likes an understated (happy) ending ... get "Alone and Gutsy, at 58." You’ll be glad. I'm flipping excited to have written myself out of more than one stuck spot through "Alone and Gutsy, at 58," a fiction in which the main character risks, to spur herself forward. A few years ago, after I’d devoured "The Autobiography of Alice B. Toklas" ~ once I stopped laughing ~ I decided if Stein could get away with such unabashed autobiographical fiction, I could mix it up too. I came to the character Tawanda Powers with great ease: three kids raised, seven books published by mid-sized houses, a steady stream of manuscripts kept "out there," yet that next match eluded me. Heading into another year alone, I couldn't seem to shake how easy it would be to start on a downhill slope, create some mysterious illness that would do me in. We don't ordinarily talk about letting ourselves slip towards death, yet I believe the possibility lies under the surface, like an entangling kelp bed ready to draw in those of us who step carelessly or unconsciously along the bluffs of middle age. Me, now? Awake, fully rousted! My first book, "Heart to Heart Caregiving," I wrote because I wasn't finding the lifeline I sought, for helping little ones. 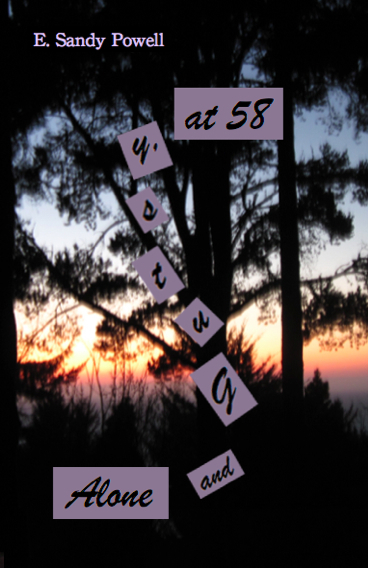 "Alone and Gutsy, at 58" became the writers’ book I craved. I’m delighted with what others are making of A & G for themselves. One of my readers, a library director, pointed out levels of accessibility to the main character, drawing lines inward, as spokes on a wheel: accepting oneself, relating to adult children, assessing one’s worklife, coming to terms with death by making a choice for life. If a woman doesn't relate to Tawanda Powers from one angle, she enthused, such as via a writing career, she's likely to connect through another ... especially at the hub where Tawanda ‘gives it up’ for her ultimate transformation.